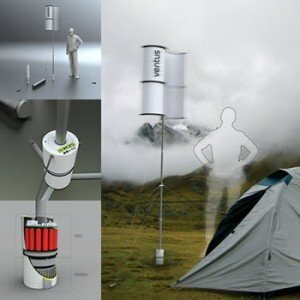 The Ventus power station is a theoretical lightweight portable wind turbine system designed by Sergej Kuckir (www.kuckir.com). The most interesting thing about this invention is it’s versatility. Imagine it, a small and lightweight folding wind power station, which can be used as a renewable source of energy during a disaster, camping trip, or scientific expedition. Kuckir says the Ventus is mainly intended for use in the mountains where there is plenty of wind energy. The Ventus power station is based on the “Savonius” type of wind turbine. Savonius Wind Turbines are simple, vertical, aerodynamically drag-type devises. The drag created by the sails spins an attached shaft connected to a rotor that is then connected to a power generation device. Originally invented by the Finish Engineer Sigurd J. Savonius in 1922. It can be built quickly and easily, the total height is 2,5 m. Thanks to the composite materials the construction is very stiff and light (4kg/8.8Lbs). The Ventus turbine is also space-saving ““ it can be packed into the tube 25 1/2″³ (65 cm) high and 4″³ (10cm) in diameter. The power station capacity is 400 W. A unique curved delta-shaped peg has been also designed for the anchoring of the turbine. In the bottom part there is a battery unit and electronics to control the electric tension and current ““ therefore the energy can be used for charging various appliances. The generated electricity is stored in the lightweight Li-Pol batteries in the top part of the basement. This “battery unit” can be easily disconnected and it can be carried separately for short trips as a powerful source of energy. Sadly, there are no plans to produce the Ventus, but we hope that an enterprising manufacturer sees Mr Kuckir’s work and decides it needs to go to market. I would buy one. The Ventus turbine has been designed during my studies at the University ““ unfortunately there are still no plans to produce it. I am still looking for a manufacturer. I am currently studying at the Faculty of Arts and Design, University J. E. Purkyne in Usti nad Labem, Czech Republic. I spent a year at the University of Derby (UK). I am interested in design concerned with sustainability, renewable energies, recyclability, etc”¦ I try to deepen my experiences in tool design and ergonomics.